BRIGHTON — Sean Osceola hopes to carry the momentum from his outstanding high school baseball season right into college. 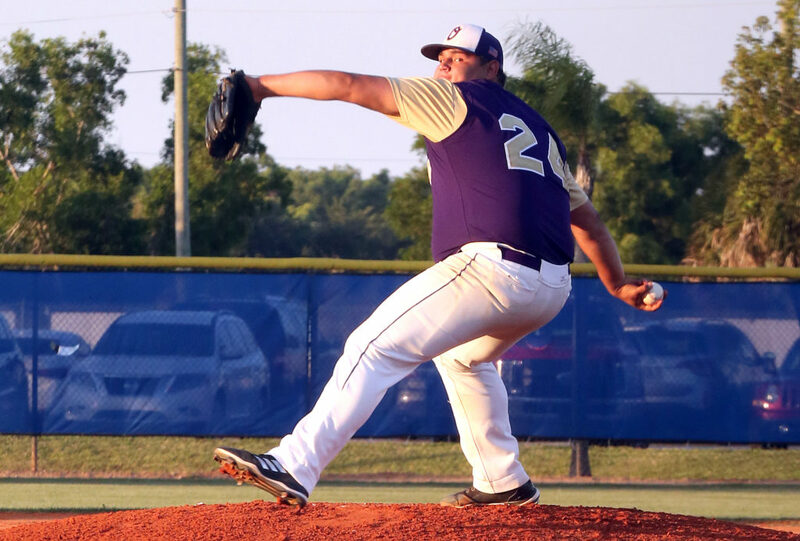 The 2018 Okeechobee High School graduate was sensational on the mound as the right-hander from the Brighton Reservation helped lead the Brahmans to stunning victories against Jensen Beach, Dwyer and Martin County in the team’s longest postseason run in 13 years. During the playoffs, Osceola, son of Reno and Kelli Osceola, signed with Pasco-Hernando State College in New Port Richey – about 40 miles north of Tampa – where he’ll play starting this fall. Pasco-Hernando has been coached by Stephen Winterling for nearly 30 years. More than 30 players from the program have signed professional contracts. In 2014, Pasco-Hernando made its first-ever trip to the National Junior College Athletic Association’s Division II College World Series and finished fourth. In 2018, the team went 36-18, marking the second most victories in the program’s history. As for academics, Osceola said he plans to study psychology. He said he’s interested in working for the Tribe, perhaps as a counselor. “I really like helping people,” he said. By staying ahead of batters, not going deep in counts and avoiding walks, Osceola certainly helped the Brahmans generate a memorable postseason run. As a .500 club during the regular season and seeded fourth in a four-team district playoff, an early exit wouldn’t have been surprising, but Okeechobee shocked No. 1 Jensen Beach in the semifinals as Osceola dueled Cincinnati Reds second round draft choice Lyon Richardson pitch-for-pitch in six scoreless innings. The Brahmans won 2-0 with a pair of runs in the eighth inning. In his six innings on the mound, Osceola fanned five, walked none and scattered five hits. Osceola was just as sharp in a 2-0 regional quarterfinal win against Dwyer (five scoreless innings and he hit a home run) and a 2-1 regional semifinal win against Martin County (six innings of two-hit ball, four strikeouts, one earned run). He had another solid outing in the regional final, but the Brahmans were ousted 2-0 by Doral Academy. During the playoff push, Osceola said he cherished all the good memories. In addition to his career with Okeechobee, Osceola also played travel ball for Team Phenom and SWFL Nation.